It found that more than one million EVs were sold in 2017, raising the total number of hybrid or electric cars on the road to more than three million. 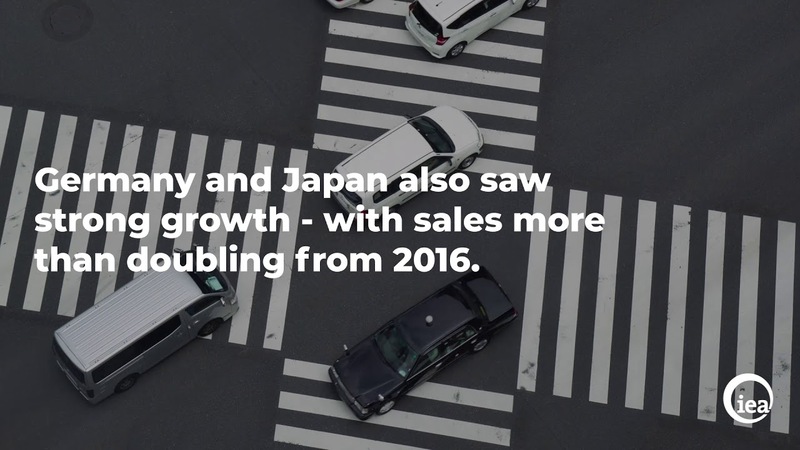 That's a 54 percent increase compared to 2016's sales, an IEA press release reported. Half of those cars were sold in China, the largest EV market in the world. Electric car sales in China rose 72 percent in 2017 to nearly 580,000 cars. The U.S. saw the second largest number of total EV sales in 2017, at around 280,000 cars sold. German and Japan both made important progress, doubling EV sales from 2016. When it comes to market share of EV sales, however, the nordic countries took the lead. Thirty-nine percent of new car sales in Norway were electric cars in 2017, the highest percentage of any country. Iceland followed at 12 percent with Sweden coming in third at six. The report found that government policies supporting EV vehicles had been essential for the boost in sales. "The main markets by volume (China) and sales share (Norway) have the strongest policy push," the IEA said, according to AFP. Helpful policies included public procurement programs, financial incentives for purchasing EVs and tougher air pollution and greenhouse gas emissions standards. The report also found that the lowered cost and improved efficiency of lithium-ion batteries helped drive growth, though more work needs to be done on both fronts to increase the appeal of EVs. When it comes to the future growth of the EV market, the report found that government policies could continue to make a big difference. The report ran two scenarios: the IEA New Policies Scenario, based on current government policies and countries' commitments under the Paris agreement, and the EV30@30 Scenario, based on an estimation of what would happen if governments worldwide adopted the EV 30@30 campaign launched by the Clean Energy Ministerial calling on member countries to make EVs account for 30 percent of vehicles sold by 2030. Under the New Policies Scenario, the number of EVs would reach 125 million by 2030, but under the EV30@30 Scenario, that number could rise to 220 million. The EV30@30 Scenario was also better for the global fight against climate change, nearly doubling the amount of greenhouse gas emissions avoided compared to the New Policies Scenario if the electric grid does not also switch to renewable energy sources. If the grid did "decarbonize," the emissions avoided under the EV30@30 would be four times the emissions avoided under the New Policies Scenario. However, the report found one humanitarian and environmental challenge with the growth of EVs: the use of cobalt and other rare metals for batteries. As the press release notes, 60 percent of cobalt comes from the Democratic Republic of Congo. Humans rights groups have raised concerns over the working conditions for miners in the conflict-heavy country, AFP reported. But the EV30@30 Scenario could increase the demand for cobalt 25 times by 2030, the report found.